I’ll come straight to the point with this review and say that I feel that with “The Snowmen” that the Doctor Who Christmas Special has finally come of age. This was an episode that struck the ideal balance of humour, scares and pathos so that it was not only a great hour of family entertainment but a fabulous episode of Doctor Who first and foremost. Matt Smith, striding about Victorian London Town looking like an overgrown Artful Dodger was his usual excellent self, Vastra, Jenny and Strax were not only very welcome comic relief but also served as a great foil for a Doctor in the depths of grief over the fate of the Ponds. Special note must be made of the striking performance of Jenna Louise Coleman. Wether being a prim and proper governess or bouncing off the Doctor as a cheeky London barmaid she simply flies off the screen. Moffat has triumphed once again in setting up a fabulous little mystery to kick off the second half of series 7. Also for the old fans we have an interesting origin story for The Great Intelligence, foe of The Second Doctor. I’m looking forward to seeing if they reoccur, Moffat is the only producer of the show to really play with causality in Doctor Who and really treat out main character as existing outside of time. With all sense of restraint thrown off, he’s freed to do anything. It also helps when the show seems this effortless and the dialogue so witty, It shows the incredible popularity of the show these days that within minutes of the episode finishing “it’s smaller on the outside” tshirts were available to buy online. Once again the wait for spring and the return of Doctor Who seems a very long way away. Scream, cry, kick the house down in excitement and reach for a box of tissues its time once again (all too soon it seems) for another Doctor Who mid series finale. 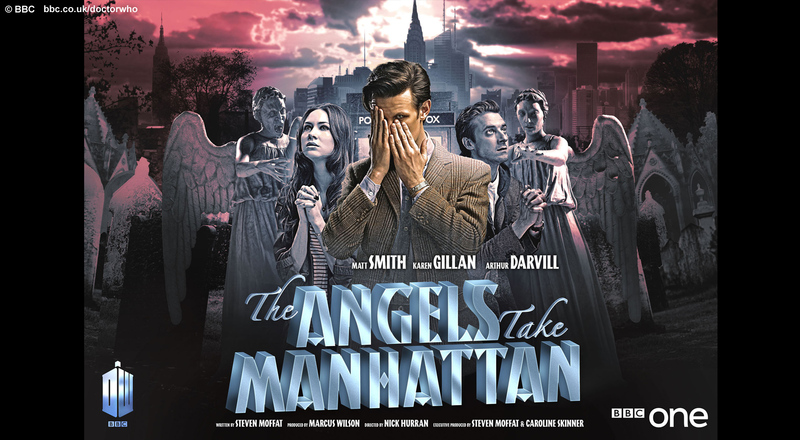 And what a finale, Moffat promised us a blockbuster every week and the past four episodes certainly stuck to that promises, going into this show it seemed we were being set up for an Al Capone type noir adventure full of tommy guns and fancy cars but as always The Moff put a swerve on us. This was very much an emotional story about our core four characters of Amy, Rory, River and The Doctor with everyone else pushed out to being somewhat extraneous characters, there to get our heroes to the right place at the right time. That seems to be my main criticism of Who these days, if you can call it one, that we never seem to have quite enough time, I wish we could have spent some more minutes with Grayle and The Weeping Angels, surely Moffat’s finest monster creation, they were horrifyingly creepy as always with those nasty little cherubs another nice, if skin crawling addition to the monsters pantheon. That being said they felt a little bit off their game here, not quite as scary or horrible as they have previously been in stories like “Flesh and Stone”. I even began to feel a tiny but of sympathy for the one Grayle had been torturing, it reminded me somewhat of the eponymous Dalek from “Dalek”. I think the Angels are something that works best if they’re kept to being an occasional treat rather than a once-a-series regular, here’s hoping we don’t see them again for a little while. On to the main meat of the episode then, The Ponds, as Moffat promised there were tears a plenty as Amy and Rory went to happily “live to death” courtesy of the Angels, never to see The Doctor or their daughter, River again. Blimey didn’t it seem a dark prospect, not many Saturday evening family telly shows where a couple commit suicide together! It all came good for them in an odd sort of way though, they got to live a long, happy life together and Moffat gave us a wonderful coming of full circle as we finally got an explanation for that odd little moment from “The Eleventh Hour” with the young Amelia. What he takes away with one hand he gives back with the other, it was a remarkably bitter sweet but fitting ending. That’s not to say that the episode had the air of a funeral as some previous departure episodes have had, there was plenty of humour and running around to be done, I particularly liked the sniping between The Doctor and River and their behavior towards each other raised a smile from me, check out The Doctor fixing his hair before he sees River again. Our core regulars gave marvellous performances across the board, Alex Kingston was smashing selling River’s combination of grief and happiness at the fate of her parents, Karen Gillan and Arthur Darvill continued their good work from the previous episodes as did the wonderful Matt Smith, being particularly effective at portraying The Doctor’s rage and loneliness as once again The Doctor is left alone, albeit with River’s warning not to stay that way for long. So what next for the good Doctor? It’s on to the Christmas Special and once again we’ve got the prospect of an unsettled, dark Doctor left to forge on through the universe alone, The Doctor says he hates endings and while its all said and done for The Ponds The Lonely God must move on and I for one can not wait to see what adventures and scrapes he gets himself mixed up in next. Roll on December. Three: it’s the magic number, it’s a hat trick and according to Pythagoras it’s the noblest of all digits but what can it do for The Doctor and his companions? And more importantly what on Earth has it got to do with a plethora of small black cubes? 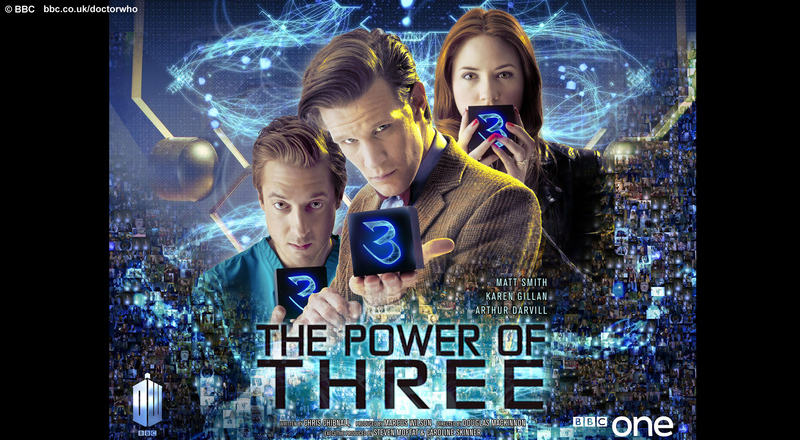 The Power Of Three, is an extremely good episode, that benefited from a lighter feel than the morality play of “A Town Called Mercy”. There were two story threads at work, the mystery of the cubes and the everyday life of Amy and Rory. Chris Chibnall has come in for sometimes heavy criticism for his Doctor Who work in the past, something I touched on in my review of “Dinosaurs on a Spaceship” but once again he has come up with another Douglas Adams like idea of an extermination via the medium of small, black cubes, at first bewildering as the populace search for meaning in them but then slowly they are integrated into everyday life, only when people accept them as part of the furniture that the cubes strike. It turns out that the cubes are just as avatar of the Shakri, a Timelord fairy story made real come to wipe out the plague of Humanity. Bill Hicks once memorably described people as “a virus with shoes” and it seems the Shakri feel the same way, you wonder why, with the Shakri able to perceive all of time, Earth is due for the exterminators. It struck me as a little simplistic that the episode turned into another “are humans all that bad?” argument. I wonder if this is something that we will be revisiting at some later date? Especially as humanity is supposed to spread throughout the cosmos, as seen in Series One. I hope so. It’s a shame that Steven Berkoff’s baddie felt thrown away in the speed of wrapping everything up. Chibnall gave the viewer plenty of treats, the now traditional celebrity appearances in the shape of ubiquitous cool science guy Professor Brian Cox and perpetually grumpy Sir Alan Sugar and for long time Doctor Who fans Jemma Redgrave led the return of UNIT to the show, and it was a lovely touch that it turns out she’s The Brig’s daughter. However as I mentioned to my other half, does this mean that “Dimensions In Time” is now canonical? God forbid. The dialogue was mile a minute, almost verging into screwball comedy in some of “lounge” scenes as The Doctor, Amy and Rory affectionately yelled at each other and it was just as laugh out loud funny. Then there’s the other side of the episode: Rory and Amy, and a glimpse into their lives. Given that the pair are soon to leave the TARDIS, this was a chance to see what they do when the Doctor isn’t around to dump an Ood in their loo and run off again. It turns out The Doctor has been in their lives for ten years, a fact that actually took me back a little, it makes you wonder just how long some of his other companions knocked around the universe with our favourite Timelord. It’s probably not surprising then that a more domestic existence has appeal and an urge to settle down permanently has arisen. we also see the consequence that Rory and Amy’s lifestyle has on the people around them. We’ve had the families of companions taken into account before, but to spend some time deepening their lives was a great move, it’s nice that Rory’s career as a nurse, a flipping good one at that, is given plenty of airtime. Hauntingly though we got Brian Williams’ realisation of what may be ahead. It was lovely to see a parent react to The Doctor without giving him a slap, unlike previous parents, Brian believes The Doctor is worth the risk but in between some excellent comedy work that sense of foreboding lingers. Mark Williams has for me been the revelation of this mini series of Doctor Who. In just two episodes, he’s had a real impact on me. Matt Smith was fabulous as always, like the cubes I’m beginning to take him for granted, the episode asks lots of different things of him. He shows off his excellent physical comedy skills once again and in his delivery of the dialogue, for example when he’s getting in a grump about being bored, he’s mesmeric. As well as comedy he also manages to get across things like loneliness, guilt and sadness without any of the changes seeming clunky or forced. There was a problem with the episode, for all of it’s quality ” The Power Of Three” just had a bit too much going on, it hit a stumbling block come the end of the episode. It felt there was plenty here for a two parter, the slow invasion storyline is wrapped up ridiculously quickly in a simple “reverse the polarity” solution. That being said “The Power Of Three” was enormous fun, very much in the manner of “Dinosaurs on a Spaceship” I feel kindly enough towards the sheer fun of it all to excuse the plot wobbles. Now though begins the wait for the mid-series finale. The promised tear jerker in our series of blockbusters. This is the end of The Three, the Doctor, Amy and Rory are apparently closer than they’ve ever been. And with The Moff around that’s a sure sign that things are about to go horribly wrong. Amongst the best episodes of the last series of Doctor Who was for me Toby Whithouse’s The God Complex, a beautifully made piece of television that was happy to steer the Doctor towards much darker places. Whithouse has history with Doctor Who, having also previously written School Reunion and The Vampires Of Venice. But with A Town Called Mercy, he’s put together something very rare, a Doctor Who Western which actually works, the previous attempt in the shape of “The Gunfighters” is not an all together well regarded effort, this is a vastly superior episode. And this is a slightly darker proposition, too. After the comparable lightness of Dinosaurs On A Spaceship, A Town Called Mercy pushes the Doctor to more uncomfortable emotional places than we’ve seen this series thus far. The cracks and strain on the Doctor are starting to show. Series 7 has demonstrated the comedy skills of Matt Smith extremely well and we also get to see his strengths when things go more serious. Smith is just terrific, his faux swagger as he asks for something strong (a cup of tea with the bag left in) while he nearly chokes on this toothpick is in wonderful contrast to his rage at Jex (him shouting at him to sit down nearly caused my eyebrows to fly off my forehead). Its also interesting to compare Jex and The Doctor, deep down they both seek the same thing. The Doctor, being shown this reflection of himself can’t cope and does something that may make some fans uncomfortable, it takes a simple statement of “this isn’t how we roll” from Amy to bring The Doctor back to Earth and to remind us that The Doctor seeks his redemption through the actions of his friends. Gillan and Darvill are still at their best, with another unspecified period away from The Doctor our companions relationship seems once again to be on an even keel but if the episode has one major flaw its that Amy and Rory don’t get a great deal to do, this very much being a tale of The Doctor’s conflicted nature. This being said it does bring Amy Pond a little further forward than we’ve seen her the past week or two. It also exists pretty much as a standalone piece, even though there’s the odd hint of undercurrent developing, Jex’s comments on motherhood being both touching and ominous. The production values ate absolutely terrific, Doctor Who has taken on three different genres this series so far, and each of them has looked outstanding. That’s no small feat, and A Town Called Mercy looks the best of the lot so far. The wild west landscapes look appropriately sunblasted and desolate, A Town Called Mercy is the most cinematic of the three episodes we’ve seen this series to date. As for the episode itself, Whithouse certainly knows his onions when it comes to westerns. He throws in a few more ingredients, too, with a sense of The Terminator in places, and a tip of the hat to the mighty Westworld in The Gunslinger with a healthy dose of humour chucked in, the horse who really prefers to be called Susan especially amusing. The early part of the episode, where he’s having fun with the genre and exploring it, is arguably when A Town Called Mercy is at its strongest, as the episode progressed I found myself wondering why The Doctor didn’t just use the TARDIS to solve the whole problem, this is addressed somewhat within the episode however its a little dissatisfying, much as in “The God Complex” Whithouse tends not to let a slightly shonky plot holes get in the way of the message he’s trying to get across. There is a small sense for me that there was a slightly better episode that could have been made out of the mix of ingredients here. That’s not to say A Town Called Mercy is a bad piece of Saturday night telly, far from it. 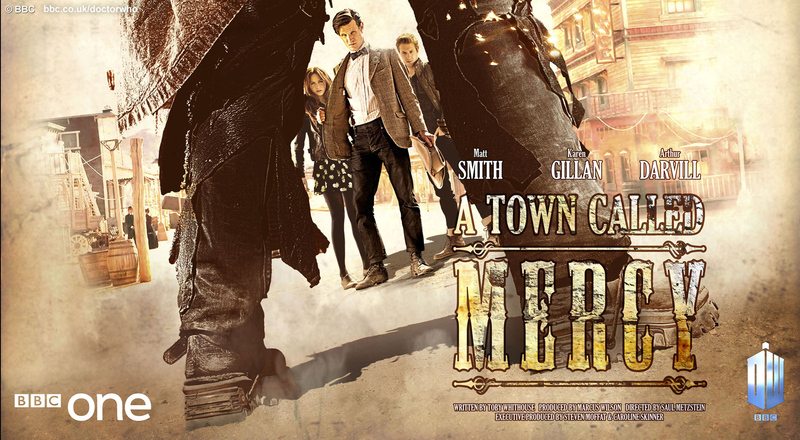 As it stands, though, A Town Called Mercy is a very good episode, with some excellent moments, all draped in utterly lush visuals, another success for the much vaunted “flexible format” of Doctor Who and another blockbuster delivered with confidence and appropriate Wild West swagger. The Christmas Special as a concept is stuck in a weird catch 22 position, does it go for a intense, plot driven episode which is very much part of the overarching mythos or does it try a fluffier, more simplistic story? The Doctor Who Christmas Special, despite only being in its seventh year has become enshrined as “traditional” now in the UK and Steven Moffat’s previous Christmas episode effort definitely favoured being “Christmassy” rather than just another episode that was the norm in RTD’s reign. 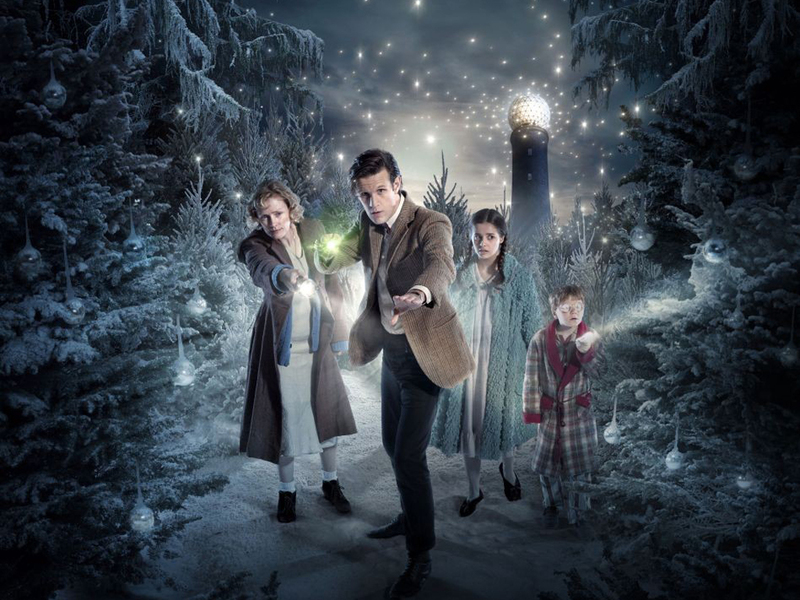 This years effort was more of the same from Moffat’s preferred Christmas story telling, with “The Doctor, The Widow and the Wardrobe” being a standalone, simplistic tale with and strong emotional core at its heart. While the story itself was probably too simplistic for its own good, lacking in Moffat’s usual head scratching plot twists and favouring the crowd-pleasing ending of having Alexander Armstrong’s character being saved its emotional center and the outstanding cast carried the day to result in probably the most satisfying Christmas Special to date. It was funny yet heartbreaking without being maudlin, the story worked well and the effects work, particularly the wooden King and Queen, who were eerily effective. The credit for the episode’s overall success must go to Claire Skinner as Madge Arwell, who was utterly compelling as a heartbroken mother desperately trying to keep Christmas sacred for her children and deal with the grief of cruelly losing her husband to war, she hit every note perfectly, in particular the scene where she is forced to witness her husbands death brought tears to my eyes. The two actors playing her children must also be recognized, I loved Maurice as Cyril, being very believable as a kid mostly stunned into wide eyed silence. Matt Smith is always so good that these days you take his excellent performances for granted, the scene at the very end where he wipes away an all too human happy tear upon being reunited with The Pond’s was simply beautiful. If I have a complaint about the episode is that it almost seem to go by too quickly, the hour absolutely tore past at breakneck speed, Bill Bailey, Arabella Weir and Paul Bazely seemed to be barely on screen as the three tree harvesters from Androzani Major (a very pleasing shout out for us old hands, along with a lovely reference to the Forest of Cheem) and so it sadly seemed like a waste to cast them at all. 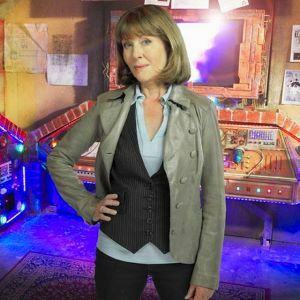 It is surprising, looking back on previous Christmas Specials how important they have been to the larger world of Doctor Who, take for example “The Christmas Invasion”, it establishes David Tennant as The Doctor, sees one of the first glimpses of Torchwood in action and prematurely ends Harriet Jones’ reign as Prime Minister, opening the door to The Master’s eventual take over of the world two seasons later. Even “A Christmas Carol”, on the face of it a fluffy modern interpretation of the classic Dicken’s tale has proven to be immensely important, establishing the eleventh Doctor’s willingness to use time travel to manipulate people to his own benefit and obliquely setting up The Silence, don’t believe me? Go back and listen to Katherine Jenkins’ song at the end, doesn’t she say Silence a lot? In particular the line “when you’re alone/Silence is all you’ll know” seems pretty haunting in retrospect. So this being said what can we infer is coming for series 7? For me The Doctor’s assertion to Madge that he can’t feel as deeply as she does sticks out for as a possible future plot point, also the episodes underlying theme of motherhood and strength is ripe for further exploration, Amy Pond referring to River Song with a very maternal “shes a good girl!” is full of potential. In summary, “The Doctor, The Widow and The Wardrobe” was perfect Christmas fare, emotional and beautifully made and for us ubernerds, full of intrigue for the future as the long wait for series 7 begins.